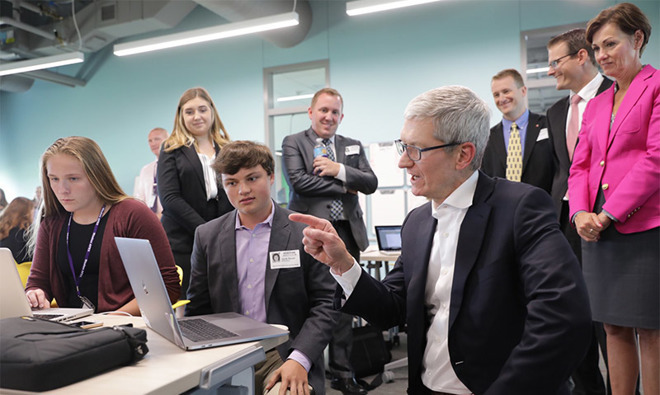 According to an anonymous tipster, Cook flew into Austin on Thursday after visiting with lawmakers, students and Apple store employees in Iowa. Cook was in the Hawkeye State to announce a $1.4 billion investment in a new data center facility in Waukee. Flight information provided to AppleInsider shows a plane co-owned by Apple made the nearly two-hour flight from Des Moines, Iowa, to an airport in Austin, Tex., late Thursday. Whether Cook was on that plane could not be confirmed. The person said Cook is set to make an AR/VR announcement on Friday, potentially in partnership with a local AR firm. What exactly Cook plans to unveil is unclear, but Apple has invested heavily, and publicly, in AR technology over the past year. Presaging future products and software, Apple in June announced ARKit, a set of developer tools that will help app makers roll out AR solutions when iOS 11 ships this fall. "We believe AR has broad mainstream applicability across education, entertainment, interactive gaming, enterprise and categories we probably haven't even thought of," Cook said during an earnings conference call this month. "With hundreds of millions of people actively using iPhone and iPad today, iOS will become the world's biggest augmented reality platform as soon as iOS 11 ships." The tipster also said Cook might also reveal a date for the company's annual iPhone event, which current rumors peg for early to mid September. This latter tidbit could be erroneous, as news of large Apple events are typically heralded by press invitations. Industry whispers earlier this week suggested Apple would hold the event on Sept. 12. Alongside new iPhone models, including a hotly anticipated "iPhone 8" flagship, the company is expected to debut a revamped Apple Watch with LTE connectivity and a 4K Apple TV. Update: Austin Mayor Steve Adler in a "tech town hall" meeting on Thursday confirmed Cook will be in town to announce a nation-wide training program. In a video of the Q&A session, spotted by MacRumors, Adler does not make clear whether the program is geared toward developers or consumers.